As Chimamanda Adichie (2009) described, stereotyping a nation flattens the experiences of a diverse people. Their histories and practices become indistinguishable, and the homogeneous ideal of ‘Africa’ is born: war-torn, disease-ridden, a continent of failed states, a place of mysterious peoples and majestic animals. Western, particularly American and British, news frames Africa negatively, with a go-to list of ‘symbolism that convinces the Western media audience that indeed what is being viewed, read or written is “African”’ (Kromah, 2002). News media appear to contribute significantly to this skewed perception of African realities and symbolism (Kromah, 2002; Berger, 2010: 182; Ginsberg, 2010: 199). De Beer (2010: 598) calls this ‘go-to’ list an Afro-pessimism code book, which entails common stereotypes of conflict, famine, entrenched poverty, failed democracy, and so forth. Spurr (1994) defines this Afro-pessimistic discourse as the ‘rhetoric of empire’ — extending control over a post-colonial country through the language and imagery used to represent it. Hutchison, Paul. (2004). Breaking Boundaries: Football and colonialism in the British empire. Student Pulse 11(1). 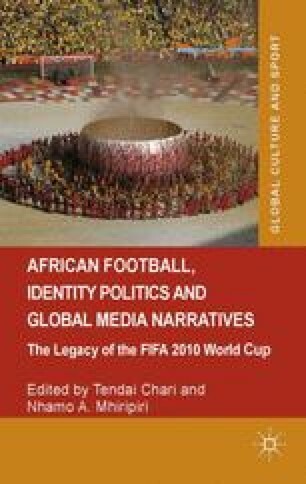 [Online], http://www.studentpulse.com/articles/64/breaking-boundaries-football-and-colonialism-in-the-british-empire (accessed 20 January 2012).